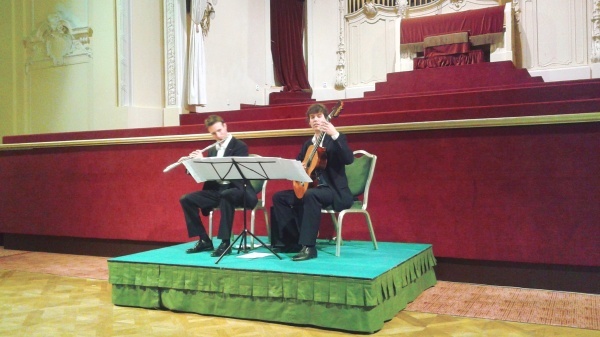 Spring has arrived and the season has started for Grandhotel Pupp and its guests in Karlovy Vary as well – with AirString Duo performing in the hotel’s beautiful Festive Hall by invitation of Embassy of the Republic of Slovenia in Prague, on 3rd May 2014. Grandhotel Pupp has been a traditional symbol of Karlovy Vary and Czech Republic for three centuries, dating back to 1701. We enjoyed the hospitality of Grandhotel Pupp for the weekend wih its sumptuous breakfast buffet, served in the elegant Mirror Hall. The choice was well fit for a brunch – from fresh fruit and salads to all kinds of cooked food (oats porridge was absolutely delicious!). 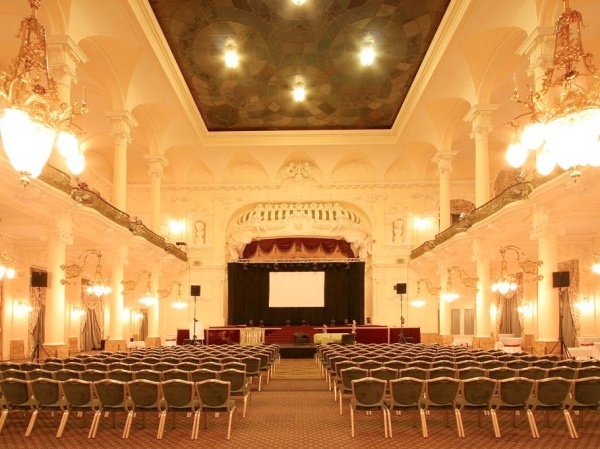 The Festive Hall was built at the turn of the 20th century and has been used as the main place for concerts and a ballroom in Karlovy Vary ever since. Acoustics and ornaments are really amazing and we enjoyed playing for an international audience where great souls like Mozart, Beethoven, Chopin and Goethe used to spend their leisure time. To touch all the ears and hearts in the audience we used this opportunity to combine some of the pieces we recorded on our Summer Skies album with some of our own arrangements. We arranged Dvorak’s famous Humoresque and the “Song to the moon” aria from his opera Rusalka in honour of this great Czech composer and to enjoy his beautiful music in his homeland. We also played our own arrangement of “Podmoskovnie vechery” to please the Russian guests and spiced it up with some jazzy improvisation. Since 1946 Karlovy Vary has also been home to one of the biggest film festivals in Europe so we added the love theme from the Slovene movie “Summer in a Seashell” arranged especially for our duo by its original author Jani Golob. The hallways of Hotel Pupp are full of photos of famous actors from Keira Knightley to Morgan Freeman who took residence there during the film festival. We’ve also found time to taste the healing water from the springs – some of them are so hot you can burn your hands on them (up to 65°C). We’ve enjoyed the local cuisine and tasted some Czech beer in local pubs as well – they really know about brewing arround there! Karlovy Vary is also home to Becherovka – a famous herb liqueur invented by Joseph Becher around 1807. Later Joseph’s son, Jan Becher, took over the company and made the liqueur famous all over Central Europe. We freshened up in hotel’s new swimming pool with its whirlpools (one of them had fresh orchid blossoms in it) and had another go at the breakfast buffet before heading back home. An uttery inspiring trip to Czech Republic was yet another step towards our next album “Spring Songs” which will be ready for you some time in spring 2015.